Please note this product has been re-packaged and re-branded by the manufacturer. It is exactly the same product, from the same manufacturer as the product we supplied previously. The main purpose of the change was to cease supply in glass bottles due to breakages in transit, hence the new "food grade" PE Packaging. Chromium is used for blood sugar stabilisation, weight control and to help keep arteries clear. We consider it an essential supplement in cases of Diabetes, Obesity and Arterial Congestion. Chromium deficiency in soil is widespread, and levels of more than 20ug per day are rarely achieved from food consumption. It may also help to regulate blood pressure and cholesterol, especially in those who consume a diet high in refined and processed foods. Wholefood Chromium is made from a species of broccoli that has been hydroponically grown in a chromium-rich environment. As such, it is a whole food form of the mineral, which has high bioavailability. Wholefood Chromium is in a whole food matrix, and hence demonstrates a high bioavailability and non-toxicity. 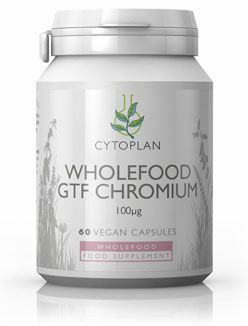 We believe this is the only wholefood GTF chromium on the market. EXCIPIENTS: Whilst all RN own branded products are excipient free, some of our resale items are NOT. We endeavour to source products with the absolute MINIMUM excipients. All of these are non-allergic and inert and are only used in micro quantities. Dicalcium phosphate, microcrystaline cellulose, hydroponically grown cruciferous vegetables providing chromium, vegetable magnesium stearate and silicon dioxide. 1-2 capsule daily, or take as directed by a practitioner. Suitable for: vegetarians, vegans and for people with Candida and yeast sensitivities. Contraindications: None, although insulin-dependant diabetics are advised to seek medical advice before supplementing with GTF chromium, as the supplement might alter their insulin requirements. Chromium is used for blood sugar stabilisation, weight control and to help keep arteries clear. We consider it an essential supplement in cases of Diabetes, Obesity and Arterial Congestion. Chromium deficiency in soil is widespread, and levels of more than 20ug per day are rarely achieved from food consumption. Please refer the the article Trace Element Deficiency. If you have any of the above listed problems then supplemental chromium is sensible at between 100-200ug daily. Most people receive 20ug of chromium from their diet, which is well below the optimum intake. Please note that there is often little relationship between RDA and optimum levels, and a lot of sickness can occur at levels above the RDA of any nutrient. Since wholefood chromium has high bioavailability it is better absorbed and assimilated. 100ug per day in this form, may be optimal, although 200ug could be taken for a few weeks. Experiment to find an individual optimum intake as individual needs vary.